I have often been frustrated by the tinny sound coming out of my Apple laptop computers when I am doing demos at meetings. All of the add-on speakers that I have found to date have been bulky and cumbersome to use. The people at Monster Cable have stepped up to the plate with a well-conceived and well-executed product. 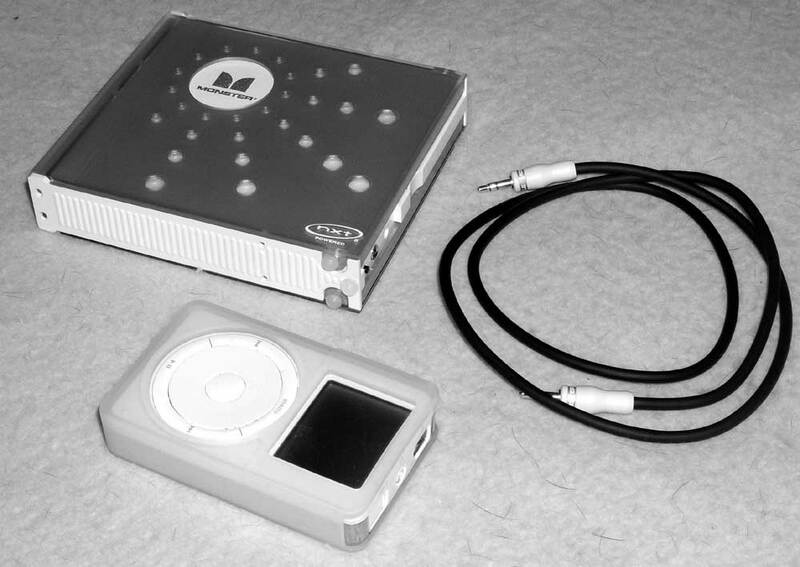 Their iSpeaker is a pair of flat panel speakers that fold into a package the size of a 3 or 4 CD case when stowed for travel as shown in Figure 1. The tiny polyurethane feet at the lower right corner of the case help to reduce sliding when the unit is set up on a flat surface. Figure 2 shows the device unfolded for use with a standard 3.5 mm stereo cable connecting an iPod and the iSpeaker. In this configuration the audio output is robust enough to be useful in a small classroom or at a trade show booth. Power comes from four 4 AA cells. Alkaline batteries are said to yield up to eight hours of playing time. 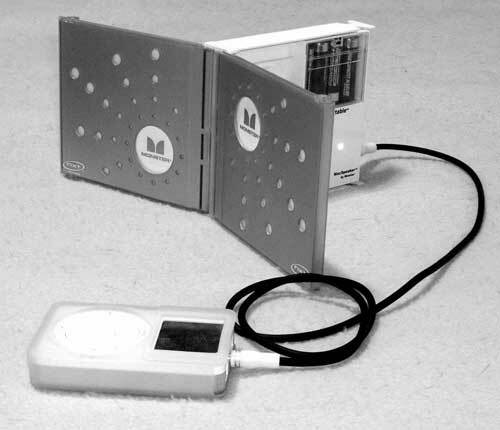 The iSpeaker ships without an AC adapter, but there is a 6 VDC power input connector that heavy users might want to drive with a DC power supply from somebody like Radio Shack. Wiring up a jack for a more muscular battery pack might be another option. I'm not sure what the amperage ought to be for such a unit. It can't be very high if 4 AA cells can handle the task. The "power-on" LED that is just visible as a bright dot near the edge of the right speaker panel in Figure 2 is a nice touch, as is the slide switch that allows the unit to be switched off when needed. There is no volume control; that is handled at the sound source. At a price of $49.95 at the new Apple outlet in Montgomery Mall, I found this unit to be an attractive and useful add-on for my original style iPod and the various laptop and desktop computers in my collection. I am pleased with the sound output and with the construction. The design is certainly more convenient than the clunky Labtech speakers that I have been using. Users with a dock-style iPod may favor the Altec Lansing inMotion product because of its built-in dock, but the iSpeaker costs 1/3 as much and delivers quite decent sound. The only "wish list" item that I have is for some sort of convenient way to store the stereo cable right in the unit. Toting around all of the disparate pieces is something of a nuisance. The bottom line is that the Monster cable iSpeaker is a product that will find a lot of friends among people who need to ramp up the sound from various devices that provide stereo output to a standard 3.5 mm mini jack.